Believe it or not, I am actually taking this whole weekend off from golf. I’m heading up to Oregon to visit some buddies and golf is not on the itinerary for once. So I wanted to have some new content heading into the weekend and this is an article I’ve been working on for awhile. Seemed like a fitting time to post it. Enjoy! If you’ve never been on Highway 101 in Oregon, you’re missing out. To me, it’s one of the most beautiful drives anywhere around. The highway winds along the rugged coast, with vista point turnoffs around just about every corner. Almost like clockwork, especially on the southern half of the coast, every town is almost exactly a half-hour apart. Brookings. Gold Beach. Port Orford. Bandon. Coos Bay. Reedsport. Florence. Waldport. Newport. From what I understand, they are evenly spaced like this as a result of the old coastal stagecoach route. Each town represents one day further than the last. 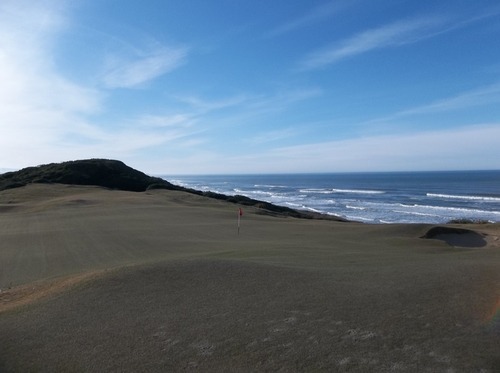 And for those of you like me who like to pair a fun road trip with plenty of golf, there are more than enough great options all the way up the Oregon coast. So, let’s start at the bottom and work our way up the 101! This course has been featured plenty on this site, so I won’t go into great detail. 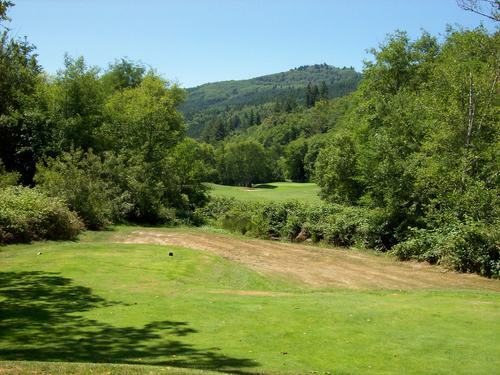 It’s target golf to the max on this relatively short, but tight and hilly layout through the woods and hills along the banks of the Chetco River. 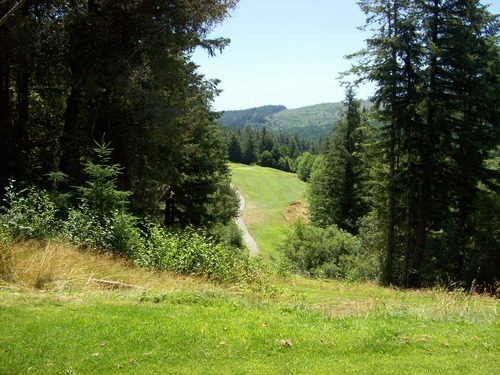 It’s a very scenic and secluded course that’s as beautiful as it is challenging. 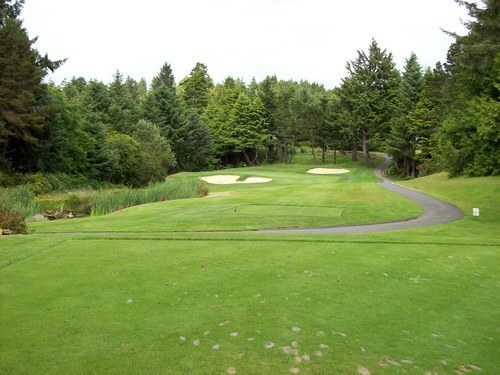 Of course, the signature hole at Salmon Run is the 4th, nicknamed “Lombard Street” because of the extreme zig-zagging cart path that leads up to the elevated tee boxes. 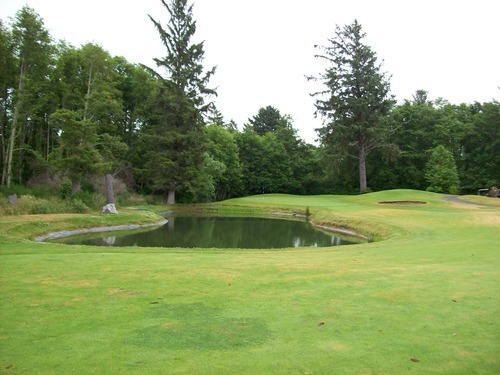 The hole features a huge island green complex and is definitely a fun one to play any time I am in the area. If you are looking for a good place to eat, the must-stop in Brookings is Wild River Pizza & Brewing Company, conveniently located right on the 101 just a little south of Salmon Run. Best pizza in the world, if you ask me. Unlike anything you’ve ever had before. Great fried potato “chips” and fried chicken, as well, to complement their own collection of local microbrew beers. About 1.5 hours north of Brookings, you’ll find the quaint fishing town of Bandon. 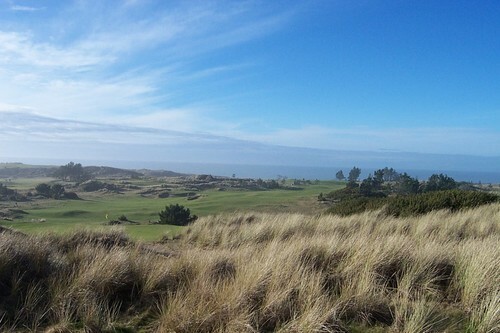 You’ll also find one of the most famous golf resorts in the world: Bandon Dunes. 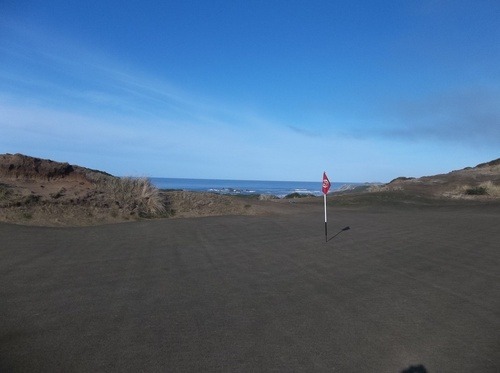 If you’ve never made the trek to Bandon, it’s all it’s cracked up to be. 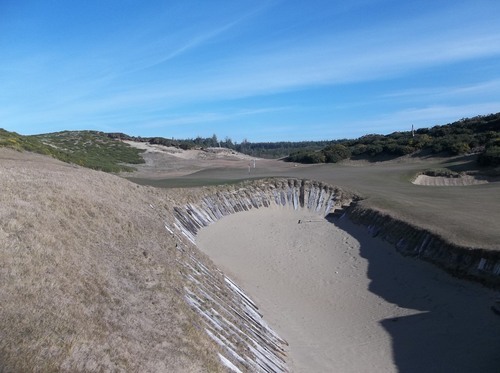 There are five courses there now (including the most recent addition, Bandon Preserve, a 13-hole par-3 course that I have personally yet to play). 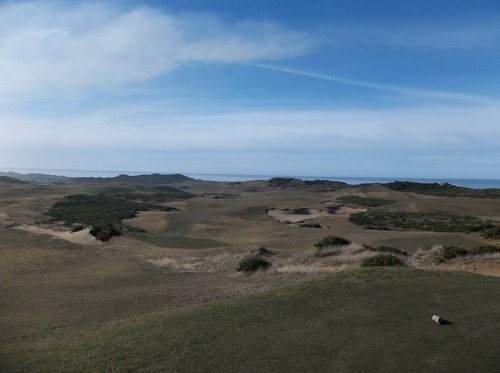 The Bandon Dunes, Pacific Dunes, Bandon Trails and Old Macdonald courses are all beautiful, challenging and unique in their own way. They have throwback links designs and natural, rugged coastal terrain reminiscent of what you might find back in Scotland or Ireland. It’s a truly one-of-a-kind experience! 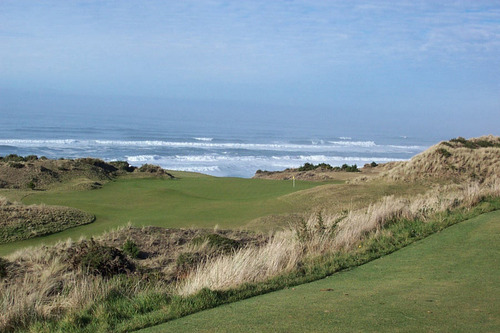 It is expensive at Bandon, though, so bring your wallet. It’s worth the splurge. 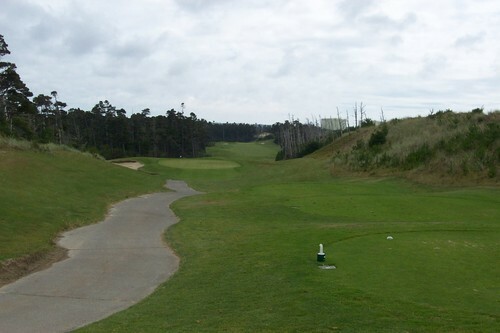 Of the four main courses, Bandon Trails is my favorite layout. 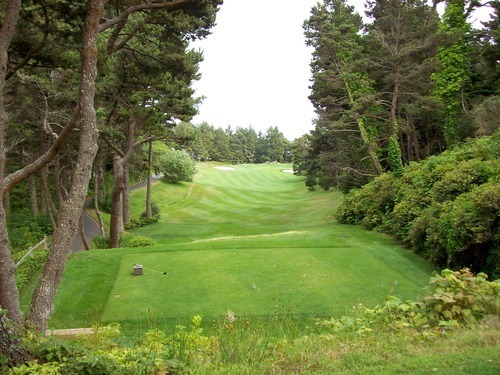 What it lacks in oceanfront views and more traditional links elements is made up for by a great course design. 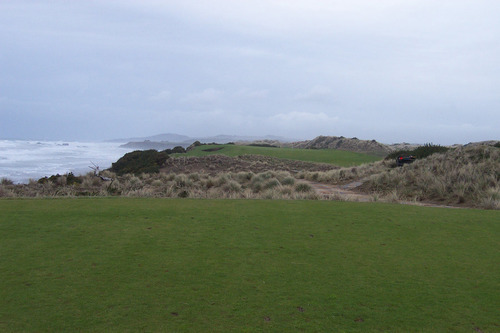 Then I’d go Pacific Dunes second since is the most dramatic and scenic (and most challenging, in my experience). 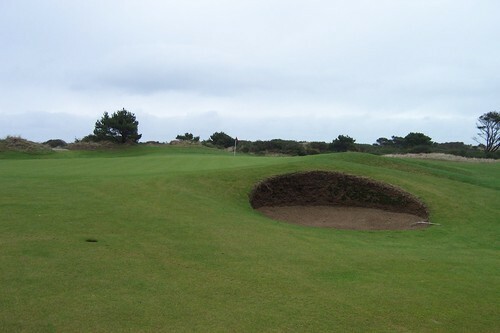 Bandon Dunes is the original and seems most “authentic” to old school UK links golf. Old Macdonald is also great. 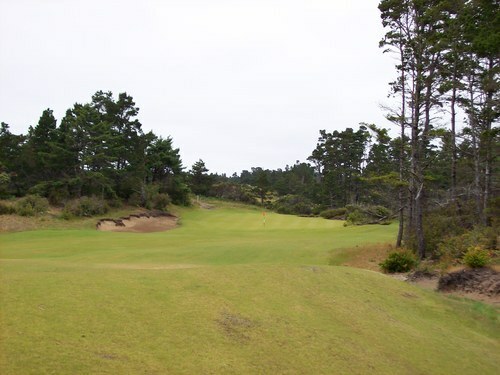 It’s truly a unique experience the way it just sprawls across the landscape with gigantic greens (largest in the world) and holes that just kind of blend together across the dunes terrain. 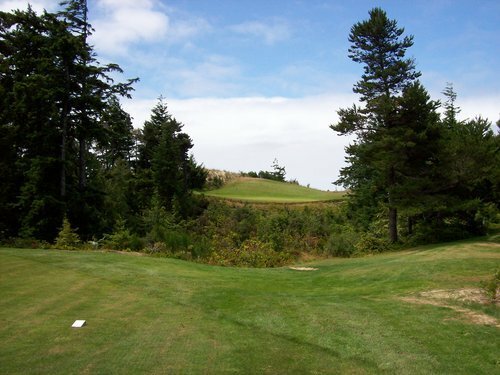 If you are in Bandon, but do not have the cash to play at Bandon Dunes, your much more affordable alternative is to play Bandon Crossings. 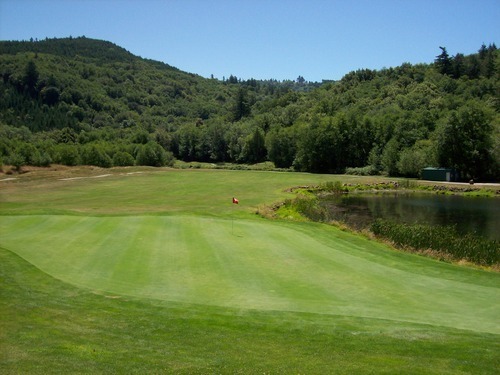 This is a relatively new course that’s set more inland than any of the resort’s courses, but I still haven’t played it yet (I plan to this summer, though). That said, I have heard nothing but great things from fellow golfers whose opinions I trust very much. 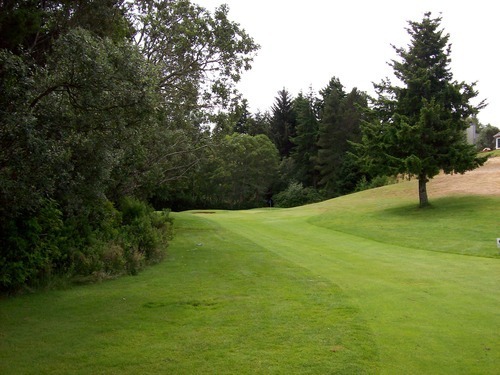 Note: This course has since changed its name to Florence Golf Links. I don’t know why, but it is what it is. 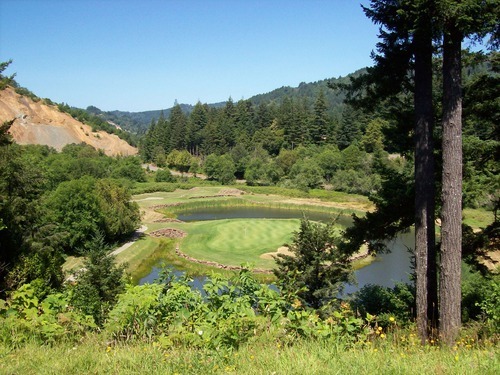 Head another 1.5 hours north of Bandon and you’ll come to Florence, which features two regulation 18 courses. First and foremost is Sandpines. 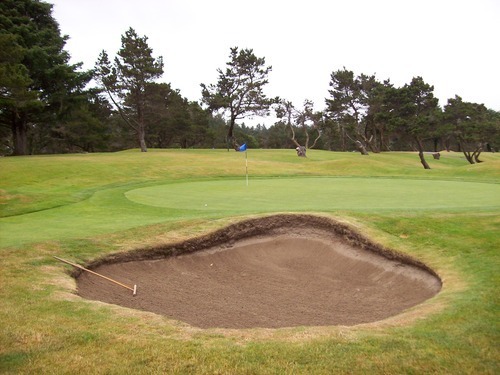 Long before Bandon was Oregon’s coastal golf capital, Sandpines was considered the premier course on the coast. 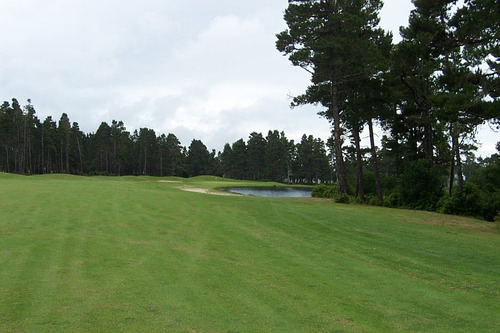 It was designed by Rees Jones, who seamlessly used the natural coastal dune terrain and native trees to craft a beautiful and challenging layout. 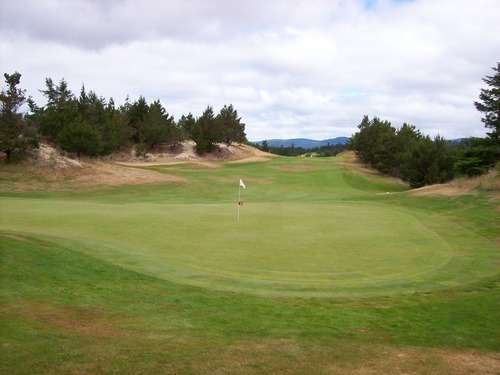 More water comes into play at Sandpines than you’ll find at Bandon, where the only water hazard on most of the courses is the ocean off to the side of a few holes (Bandon Trails does have a couple of natural ponds in play). 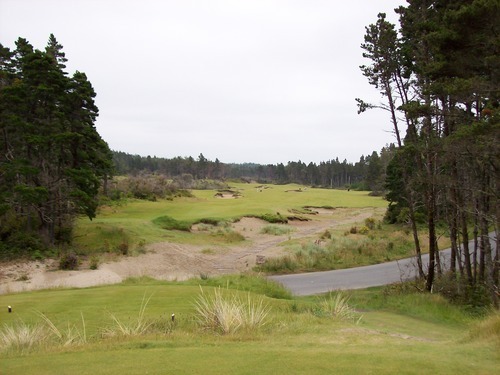 Sandpines is an excellent course and should not be forgotten just because Bandon gets all the attention nowadays. Not far from Sandpines you’ll find the “poor man’s Sandpines,” otherwise known as Ocean Dunes. This is not a bad course at all. 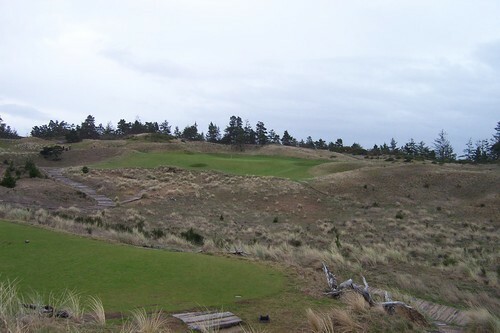 It’s actually quite a fun links style layout that uses a lot of the same elements of Bandon and Sandpines. The prices are much more appealing than those courses, as well. The trade-off is that the conditions and service attributes are not to the same standards of those resort courses, but that’s okay. 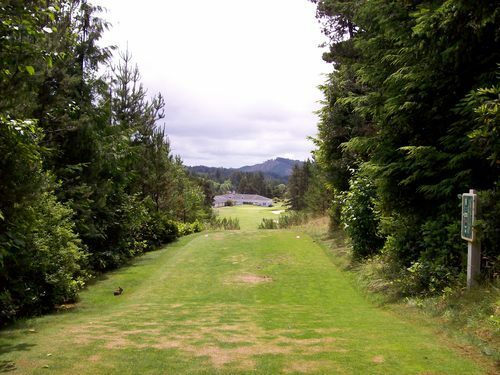 This is a course that caters more to locals, so it’s not a “destination” course by any means. 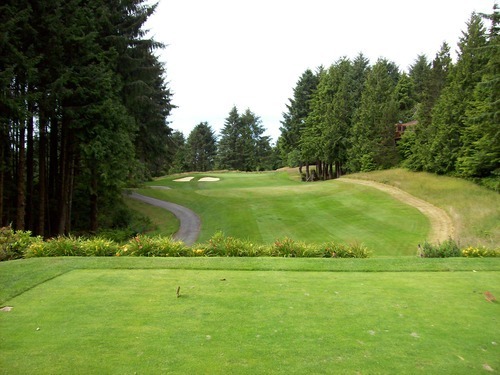 But it’s a decent option if you are looking to tee it up while in the area and don’t want to spend a ton. About 2 hours north of Florence you’ll find Lincoln City. 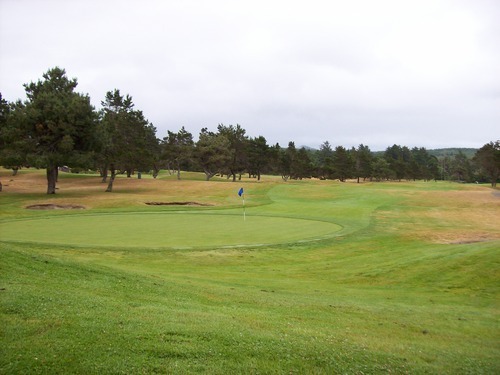 Just before you get to Lincoln City, though, you’ll go right past Salishan. This is a nice resort that features a very nice golf course. It’s a little overpriced because of the resort amenities, but it’s an excellent layout. 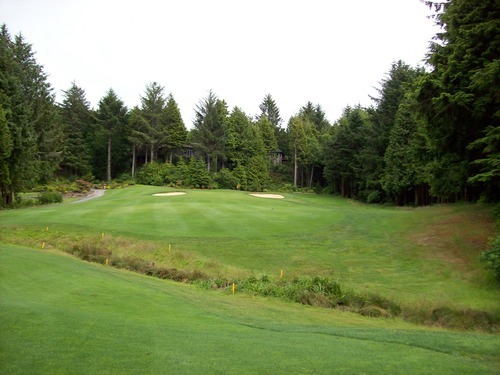 The front nine winds through some heavily wooded areas with lots of big doglegs and hilly terrain. 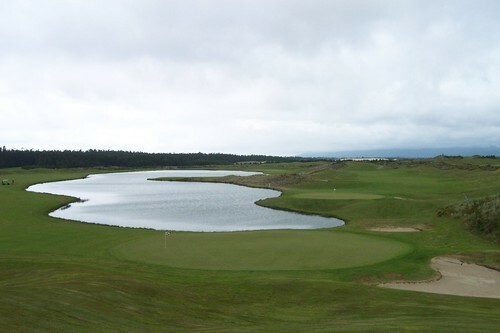 The back nine runs along a coastal marsh area. It opens up and flattens out a bit more until you reach the finishing few holes, but is still very scenic and enjoyable on all levels. 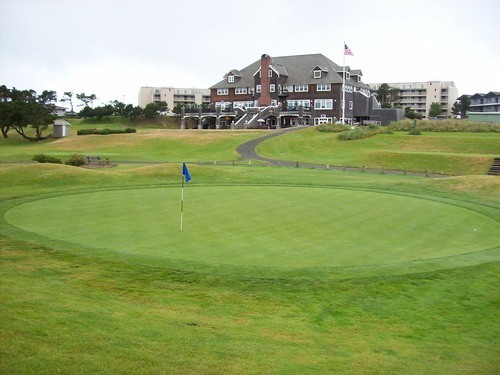 Also in Lincoln City is Chinook Winds Golf Resort, which is a semi-private course tied to the casino of the same name. I haven’t played it yet and really don’t know much about it, but I’m sure it’s very nice given the excellent location and resort connections. Lastly, you get to the top part of the Oregon Coast, about 2 hours from Lincoln City. Just south of the border town, Astoria (Goonies Forever! 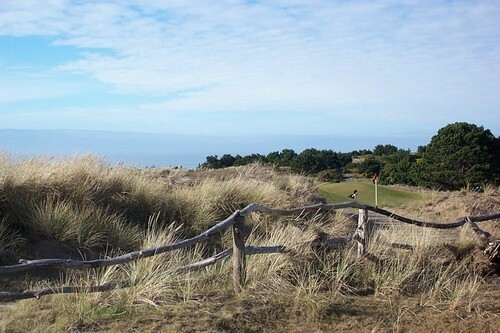 ), you’ll find Gearhart Golf Links. 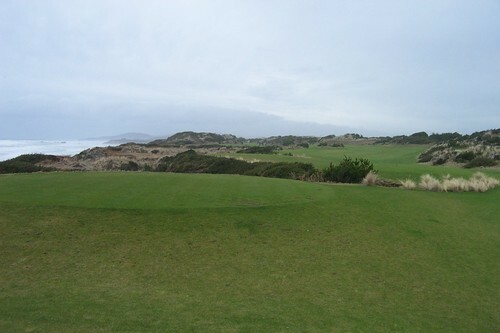 For the record, Bandon did not invent the idea of traditional Scottish links style golf on the Oregon Coast. Nor did Sandpines or Ocean Dunes. 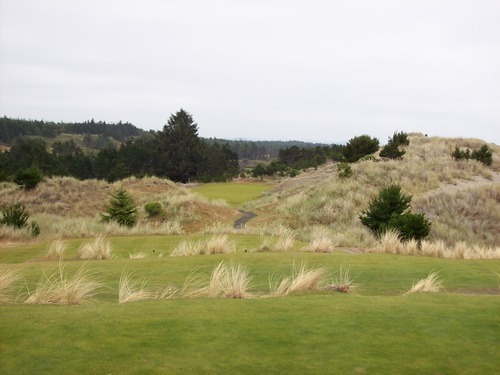 That’s because Gearhart is one of oldest courses west of the Mississippi. 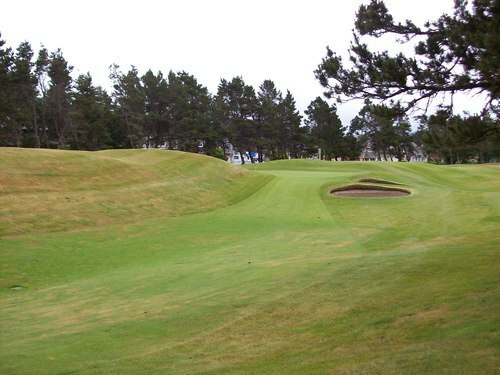 Legend has it, this course started as three golf holes in 1888 and grew from there as the years went on. It retains an old-school feel that can be found throughout the course and with a really neat-looking clubhouse building that is an ode to the game’s traditional UK roots. 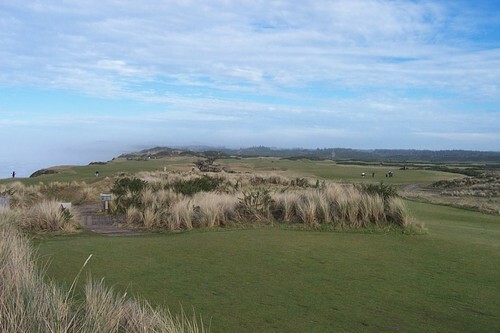 The links layout at Gearhart isn’t a “dramatic” sweeping dunes style like at Bandon. 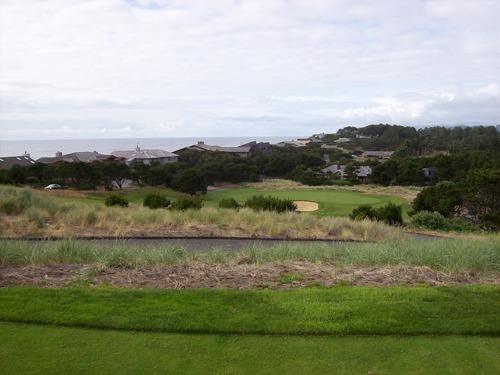 It’s a much more simplified traditional inland design (very close to ocean, but not right on it), so don’t go there expecting to be blown away by any ocean views or awe-inspiring design features—just fun, pure golf on a timeless course. 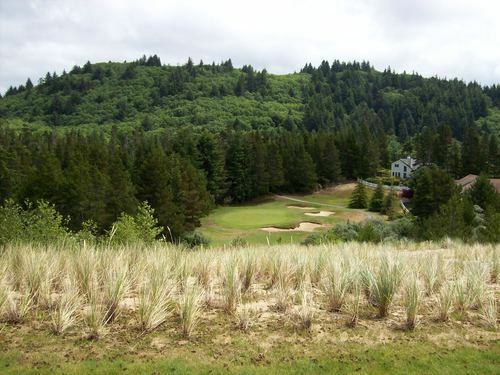 That concludes my tour of the most notable courses along the Oregon Coast that I’ve had the pleasure to play. There are quite a few nine-hole courses mixed in between, a handful of private clubs and a few lesser-known 18-hole tracks, too. Unfortunately, I haven’t had the chance to play any of these yet, so I have no feedback or information about any of them. Perhaps someday I’ll get to play them all. I’d sure like to try! 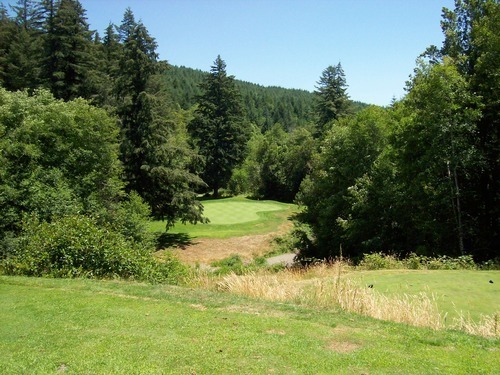 Note: Since I posted this article, I have played many of the other courses on the Oregon Coast. I have also gone back to replay some of the ones featured here. 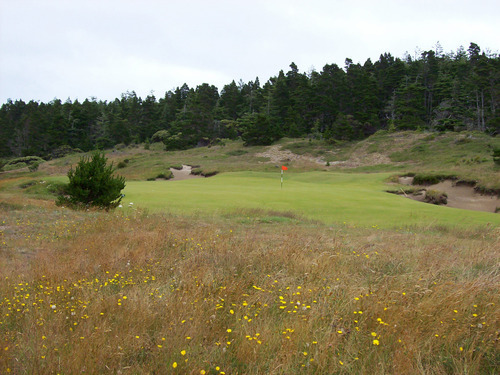 You can find the most recent review links and a full list on my Oregon Coast Regional Rankings page. Please know that some links will return back to this article if I haven’t done a newer review of the course.